The Court of Appeal for the First District granted plaintiff’s motion to dismiss an appeal, where the employer appellant sought review of a trial court order that did not compel an employee to arbitrate her PAGA claims. Reyes v. Macy’s, Inc., No. A133411, 202 Cal.App.4th 1119 (1st Dist. Dec. 21, 2011). The court held that the portion of the trial court’s order that failed to compel employee to arbitrate her class claims and PAGA claims was not immediately appealable; and plaintiff’s PAGA claim was not an individual claim and thus was not within the scope of arbitration request. Id. (holding that the order granting Defendant’s own motion to compel arbitration of the individual claims “is not appealable, and the remainder of the order denying the motion to dismiss representative [PAGA] claims is not a final judgment and, therefore, also is not appealable . . . .”). 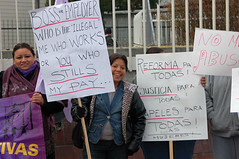 Plaintiff and respondent Reyes brought action against her employer Macy’s, alleging numerous class action labor code violations and a cause of action under the Labor Code Private Attorneys General Act of 2004 (“PAGA”), as well as individual claims for discrimination, harassment, and retaliation. Id. The Washington Post reports today that New York Governor David Paterson has signed into law the nation’s first expansive domestic workers’ rights measure. The law provides for overtime pay for domestic workers in addition to time off and protections against sexual harassment.